OutMUMbered: 31 Day Blog Challenge: Who's With Me? 31 Day Blog Challenge: Who's With Me? Introducing the 31 day blog challenge here at Boy Oh Boy starting on 1st May. Each day I will publish my own post to the days theme/ question/ prompt and I will set up a linky so that you may all join in too. I've made a button to go along with your posts... spread the word! So who's with me? I can't wait to see what your posts! Sod I I think I'll give it a bash! Need to get my blogging mojo back! I really want to blog more. Count me in! I just hope I can stick with it. Hello from The States! I found your wonderful prompts via Pinterest and I'm going to give it a go. I think having a daily prompt will help me get my mojo working. Thanks for this, I'll be back! So, is it too late to start? I know it will take me into June to finish, but I think it would be fun. I found this on pinterest. Seeing how this is the start of another 31 day month I'm going to use your prompts. Thanks for the list, I can't wait. Found this a little late but I love the idea. Will give your page a shout out! Thank you! Great writing prompts. 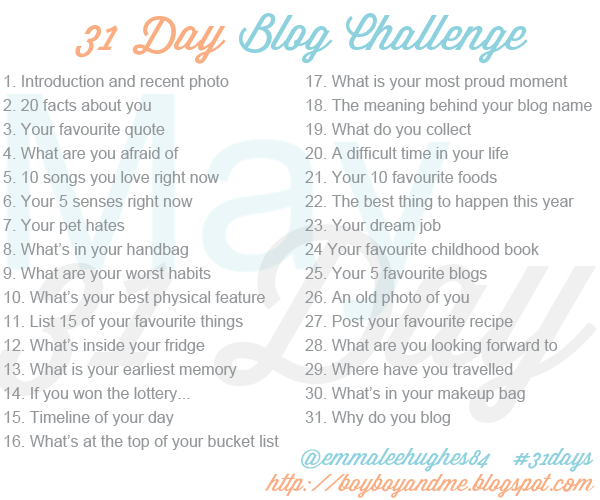 31 Day Blog Challenge starts tomorrow! Nate is three months old! 30 before I turn 30!